Professional embroidery services to customers throughout Norwich and the surrounding areas of Norfolk. Here at Ink & Stitch we offer our professional embroidery services to customers throughout Norwich and the surrounding areas of Norfolk. 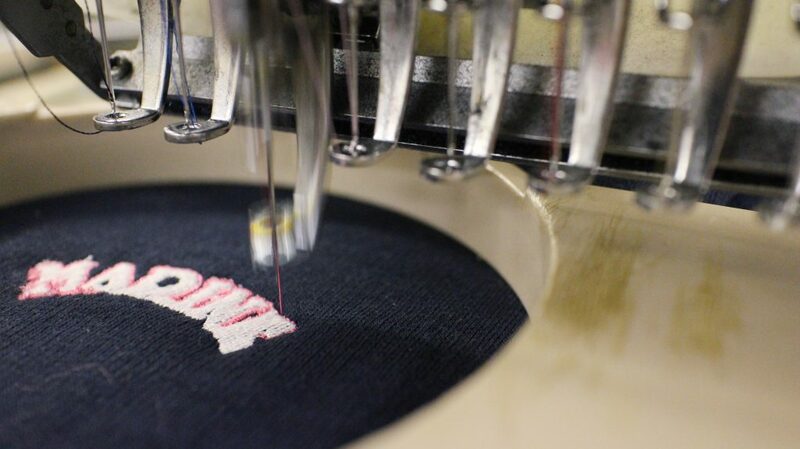 Embroidery is the process of sewing a digitised design onto a garment such as a t-shirt or hoodie. All of our embroidery is carried out using the latest machinery and quality materials to ensure a high standard of finish. If you’re in need of embroidery carried out in Norwich or any of the surrounding areas then be sure to get in touch with Ink & Stitch. We are able to embroider almost anything onto garments. Once we have your logo or design digitised using our embroidery software, we’ll upload it into our computerised embroidery machine for the sewing process to start. Each product that comes off our advanced embroidery machine is individually checked for compliance with our quality standards; this gives you the extra peace of mind that the item you receive will be of a high standard. We have been offering our embroidery service in Norwich and the surrounding areas for many years and have developed a well-known reputation for the quality of the work we carry out. As one of the leading embroiders in Norwich, we believe we should be your first port of call for embroidery. When it comes to needing embroidery carried out in Norwich or any of the surrounding areas in Norfolk, be sure to make Ink & Stitch your first port of call. We offer a full embroidery service which covers everything from the digitisation of the design to the finished product. We only use quality garments, materials and technology to ensure a high standard of finish. If you’re based in or around Norwich and are interested in having embroidery carried out, then be sure to get in touch with Ink & Stitch. Fill in our contact form and one of our team will get back to you as soon as possible. Alternatively call us directly on 01603 952989 and one of our team will be on hand to assist. Embroidery creates an impression of quality and style, that printing simply can’t compete with. Whilst being slightly more expensive than other options, it’s perfect for when you’re trying to achieve that professional look. We regularly carry out embroidery on a number of garment including polos, jackets, caps, knitwear and much more. Embroidery is proven to outlast the garments it’s applied to. Using the latest in advanced embroidery software and machinery, we are able to offer a low-cost embroidery service. However large or small your embroidery order might be, you can count on Ink & Stitch. We have been using Ink and Stitch for a number of years. They always provide excellent prices and services. Would highly recommend. Awesome quality products, awesome speed, awesome communication and to top it off Jon is an outstanding guy. What more can I say apart from the fact that I heartily recommend!! Awesome service, super-friendly, reasonable prices and accommodated my "last-minute" merch printing needs without any fuss at all. Literally the best! !